The tax code becomes more complicated each passing year regarding inheritance and estates, requiring attorneys and CPAs to stay abreast of developments in law and financial management. 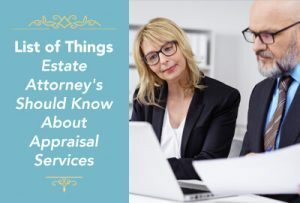 Often, estate attorneys and CPAs think about appraisal services only at the very end of their projects (or cases), and they frequently have a short time frame to get an appraisal. It pays to have an experienced estate appraiser at the start of a project. In this blog, I will highlight things that tax and estate attorneys and CPA will find useful when looking for or working with a certified appraiser. Just as board certification indicates a physician or attorney has reached the highest accreditation in their respective professions (and specializations), appraisers have accreditations and certifications that demonstrate excellence and further education. Additionally, an appraiser may specialize in certain types or eras of fine art and antiques. Be sure to ask an estate appraiser if they have in-depth experience with the types of pieces in the estate. As mentioned above, you should seek out an appraiser who is a member of a nationally recognized appraisal organization whose appraisals adhere to the guidelines of the Uniform Standards of Professional Appraisal Practices. Like any profession, appraisers may specialize in a wide array of areas from 18th-century English antiques to Modern Art to mid-century Scandinavian designs to 17th-century French art and furniture to Art Deco to western collectible and art. If you client has a large collection specific to an era or items, it makes sense to find an estate appraiser with specialization in that area. If your clients have a sizeable estate that has not been appraised in recent years, now is a perfect time to do one. Having a more current appraisal on hand in the event of a natural disaster, fire, theft or death can help your clients and their loved ones navigate a stressful and emotionally challenging event a little bit more easily. I hope you have found this blog article useful and informative. If you have any questions or are in need more information for your practice or clients, I invite you to contact me.